Olympic Day today. And a particularly timely one with Rio 2016 just around the corner. Elite athletes around world (well, the clean ones at least) will be in the final stages of preparing for their lifetime’s pursuit. A few of my friends in the rowing world will be making the trip to Brazil with Team GB. 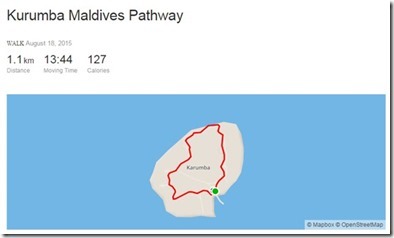 If you fancy a bit of chill before the thrill (or you are consoling yourself for missing out on selection), then you can still carry on your roadwork training in the Maldives…at Kurumba. The resort features a handy little running track effectives. A paved pathway circumnavigating the island. Running on the beach can provide a more exhausting workout, but the unsteady surface can result in a losing your footing and maybe even twisting your ankle (not something you want to either right before your Olympic event or even just on holiday). 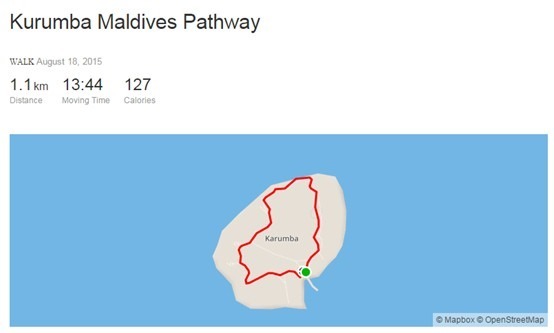 Many paths in the Maldives crisscross the islands, but Kurumba’s is a handy loop which allows for a convenient circuit just over a kilometre (see above). Some parts pass under nicely shading palms trees and other parts run fairly close to the ocean’s edge for an inspiring seaside vista. Every time we have visited the resort, we have seen a guest jogging on it. In fact, GM Jason Kruse shared his own run (see above).